Technology is truly incredible. Watching Aimee Mullens' video "My 12 Pairs of Legs," I couldn't help but think about how amazing these prosthetics were, and yet how most people who need them would never have access. It's amazing that she is working to change the cultural bias of the word "disabled." However, having a prosthetic, let alone 12, is only an impossible dream for most people. I worked at a prosthetics clinic in Bolivia, a country where 90 percent of people who need prosthetics do not have access. It's absolutely staggering. In the US, technology helps Aimee and people like her overcome social barriers for "disabled" people. In other parts of the world, technology is also helping to overcome barriers to access prosthetic technology -- perhaps an even bigger challenge. At Centro de Miembros Artificiales (CMA) , one of the few, free prosthetics clinics in Bolivia, we saw patients who had not walked for a decade. This is in great part due to the extreme cost of prosthetics. In Bolivia, the cost of prosthetic limbs are on par with those from the US ($8,000+ each limb). This is in a country where the minimum wage is 647 bolivianos or $93 a month. At that wage it would require well over a decade of saving to buy one limb. This problem is compounded when a person becomes homeless due to an amputation and therefore, unable to work. Patients at CMA in La Paz, Bolivia. In the US, there is certainly a stigma against people with missing limbs and a limitation to certain types of non-physical work. However, in Bolivia, because of the physical nature of most of the working class jobs, having four limbs is crucial for basic survival. Often, becoming an amputee in Bolivia means becoming a dependent living outside of society. It isn't uncommon for people to lose the ability to work, their homes and their families. These people are truly disabled. Not because of their amputation, but simply because of where they live. However, there are technologies working to change this. The LIMBS knee that has helped thousands of people. LIMBS International has created a low cost knee that we are using at our clinic. This knee allows prosthetic limbs, ones that might cost as much as $30k here in the US, 50 times less expensive. Northwestern University has also given us a technique to produce cheap but effective feet made by a simple plastic press made of wood. It is this advance in cheap prosthetic technology that allowed us to give Jorge a second life. Jorge was electrocuted while working on a power line, losing all four limbs. He went from supporting his family, to being dependent on them to feed him, wash him and help him use the bathroom. 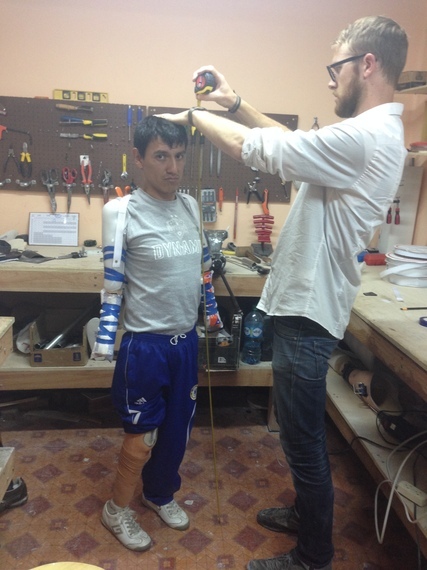 In Bolivia, there is little workers' compensation for Jorge to give him money to buy prosthetic limbs. Now, he is getting new arms and legs that give him a semblance of his old life. A picture of Jorge getting fitted for his new limbs. As MIT professor of bionics Hugh Hurr states, "A person can never be broken. Our built environment, our technologies, are broken and disabled." In Bolivia, people are disabled not because of their bodies, but because of the lack of access. However, patient by patient, this changes every day. I have deep gratitude to Aimee for spreading this message of empowerment, and for turning what might normally be considered a weakness on its head. And of course, I have deep gratitude for the staff at Centro de Miembros Artificiales for living that message.